The morning was comfortable. Made it easy to get up and moving. Dressed in cycling clothes only (no layers of street clothes) which made getting away quicker. Left camp at 6:50am. Started the first climb right outside town. Once I got to the downhill, I really pushed to take advantage of gravity. I wanted to get to the next camp before the day reached the hottest part. Then came the long climb of the day – eight miles. There were some places where we got a little relief. Not sure of the grade but I probably averaged five mph over the whole distance. The first 60 miles were in mountains and so it was cooler than the previous days. Descending from the second climb, I, again, gave it all I had. When I reached the valley, the two guys who’d been following me down the hill passed me. So I jumped on. Then another lady that I’d passed on the downhill jumped on after me. It was great having a group to ride with. We caught up to a couple and rode with them for a while. Eventually my feet started burning so I dropped off. There was a house with lawn, trees and shade. I stopped there, took off my shoes, did a foot massage and then felt better. A group of four women rode by so I caught up with them and rode for a distance. When we turned a corner and it was slightly downhill, I took advantage of gravity again as the other four ladies seemed content to maintain the same pace. Arrived at camp around 1:30pm. Today’s ride was nicer because most of it was cooler than the previous days. 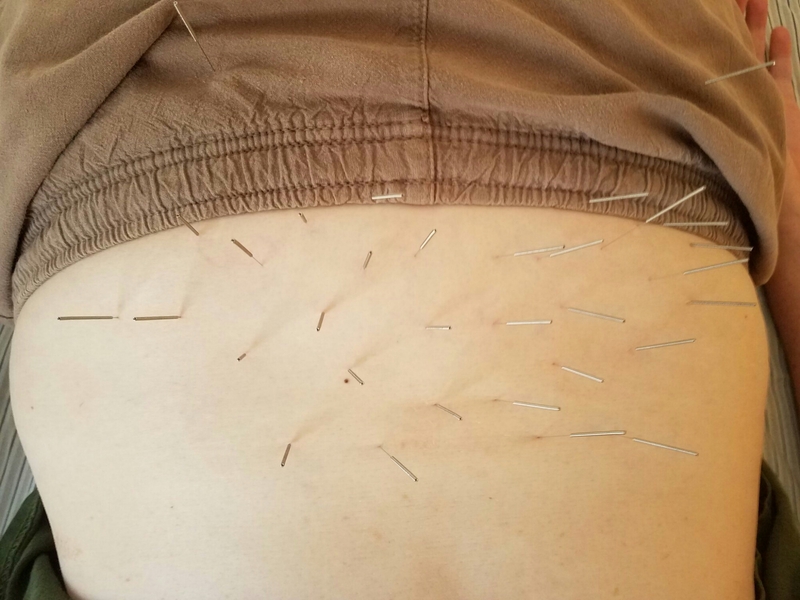 My lower back was really hurting on the climbs so I went to the acupuncturist who is working the ride. She took photos of me covered with pins. Waiting to see if it helped. My right side hurt when I first got up today so that’s another issue I hope she fixed. Pins in lower back. Good or not? At our rest stop at Anthony Lakes, it’s well worth the very short trip down to the lakeshore, for the view and even the swimming, if cold water is your thing. Later in the day we’ll connect with the Grande Tour Scenic Bikeway for our ride into Baker City. Once known as the “Queen City of the Inland Empire,” Baker City still oozes with old Western style and remains a hub of Eastern Oregon. In 1865, Baker City transformed virtually overnight, from a swath of land hosting three cabins to a premier Western outpost with a saloon (built first! ), hotels, livery stable, blacksmith, store and several other buildings on its main strip. Backed by gold mines, timber and the arrival of the Baker Short Line Railroad in 1884, the city continued to grow—by 1900 it was the largest city between Portland and Salt Lake. Baker City was also struck by fires in its early days; however, it rebuilt many of its original structures in brick and stone, and some of these are still standing today, including the Geiser Grand Hotel. Built in 1889, the three‐story brick‐and-stucco structure was lavish for its time, with plate‐glass windows, electric lights, baths and an elevator. Today this high‐desert city remains a vital center of activity in Eastern Oregon (including an annual Hell’s Angel’s meetup to ride Hell’s Canyon)—and with 5 Scenic Byways passing through, there are many ways to return and revisit this modern city rich in history. There’s a strong culture of artisans in Baker City; a downtown walking/shopping trip will let you meet artists, makers and other interesting folks. Barley Brown’s brewery and brewpub is not too far from our camp. For a shady spot to relax, Geiser‐Pollman Park is just two blocks from our camp site (we’ll be having our concert there on Layover Day). Baker City has a plethora of interesting buildings and historical sites; it’s worth just ambling around town exploring. Can you find the open‐air Salt Lick Art Gallery? If you like bakeries, there’s a great one in town. Check out Sweet Wife Baking. The Baker Heritage Museum couldn’t be more convenient—it’s just across Campbell Street fromour site. Wander around Historic Baker City to get a taste for the turn‐of‐the‐century architectural variety on display—and for a bit of indulgence, check out the Geiser Grand Hotel, still receiving guests 129 years since opening, and peek inside for a look at the mahogany interiors, stained‐glass ceiling and crystal chandeliers. You may also want to cruise by the Leo Adler House Museum, a 19th century restored Italianate home that belonged to Baker City philanthropist Leo Adler. Tours are given on Fridays, but even the facade is picturesque. If you’re feeling more ambitious about a great museum experience, maybe pedal out to the Oregon Trail Interpretive Center, a few miles east of town on Highway 86. There’s a swimming hole 6 miles south down Hwy 7. Right where the long straight stretch ends, on the left the river gets wide, and this is where the locals gather to take a dip.